Mountlake Terrace, population 19,909 (2010), lies 13 miles north of downtown Seattle in Snohomish County, Washington. With three exits on the Interstate-5 freeway, the City is well situated in terms of access to the Puget Sound Region. In 2010, the City amended its Freeway/Tourist District regulations, limiting building height to three or four stories if the City did not ultimately adopt a TDR program but allowing various bonuses up to a 20-story limit if the City eventually adopted a TDR program. In 2010, the Washington Department of Commerce awarded a grant to the City to prepare a TDR study and ordinance as well as associated environmental documents and interlocal agreements. The City Council adopted a TDR ordinance in December 2012 that allows the transfer of development rights from farms, forests, rural lands and environmentally-critical areas in Snohomish, King and Pierce counties into a small portion of Mountlake Terrace’s downtown as well as its Freeway/Tourist District. By adopting this ordinance, the City is a step closer to qualifying under state law to use tax increment financing to fund infrastructure including the construction of a new connecting street in the Freeway/Tourist District. In addition to being located in unincorporated Snohomish, King and Pierce counties, sending areas must be designated by their respective counties as agriculture or forest lands of long-term commercial significance or lands that otherwise meet the sending area criteria of Washington statute 39.108 which governs the three-county central Puget Sound regional TDR marketplace. To qualify for TDR issuance, a conservation easement must be recorded on the sending site that meets the requirements of the county in which the site in located. The grantee must be the County or a third party authorized to enforce the terms of the conservation easement. The TDR ordinance of the sending site county establishes the number of TDRs issued in return for recordation of the conservation easement. The larger of the two receiving areas is within the Freeway/Tourist District, located on the east side of I-5 immediately north of a freeway ramp and south of the Mountlake Terrace Transit Center. As shown on the map below, this zone has six building districts. Different TDR baselines and bonuses apply in each district, as follows. 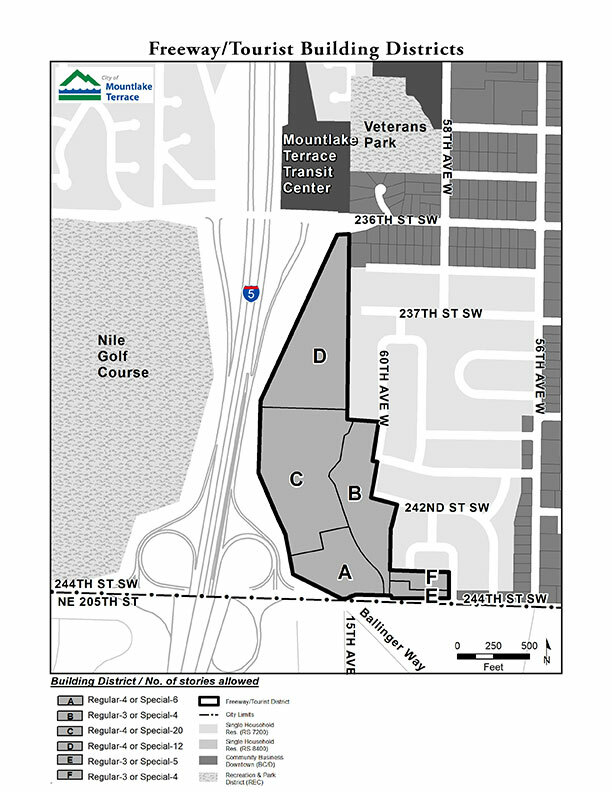 The second receiving area is a single parcel in downtown Mountlake Terrace, designated BC/D Building District B Incentives Overlay, bounded by 56th and 57th Avenues West and 231st and 232nd Streets SW. This district has a baseline of 5 stories but 6 stories are allowed for projects that achieve sustainability targets including meeting the TDR requirements for bonus floor area. In Mountlake Terrace’s two TDR receiving areas, a TDR from Snohomish County or King County allows 10,000 bonus square feet of commercial floor area or two bonus dwelling units. One TDR from Pierce County allows 5,000 square feet of bonus floor area (presumably bonus commercial floor area). Receiving area developers can buy TDRs from sending area landowners, a TDR bank or any other intermediary. The City can grant preliminary approval indicating the number of TDRs that the developer will have to produce prior to final project approval. The ordinance establishes a staff position of TDR Manager responsible for maintaining a TDR registry documenting the history of all TDRs by serial number, including all intermediate transfers, from their severance from a sending site to their retirement in a receiving site development. The TDR Manager must also prepare an annual report documenting all TDRs issued, transferred and retired and recommending TDR program amendments as needed.